Take some time to think about how you might answer this question: Are you an audiophile? At a recent dinner party, a guest who knew that I write for Ultra Audio asked me if I was an audiophile. Rather than quickly blurt the affirmative, I considered the ramifications of such an answer. In some circles, audiophiles are viewed as narrow-minded, obsessive, and somewhat antisocial -- think stamp collectors, but not as well adjusted. It’s easy to see why. I explained to this guest that I was reluctant to accept all the baggage that came along with the audiophile label, but for the purposes of moving the discussion forward, I said, in effect, "Yes." It was my kind of party -- 12 women and two men, including me. Once the cat was out of the bag and those assembled knew that I was knowledgeable about sound equipment, the questions began to fly. Had my audience been predominantly male, the conversation would no doubt have turned to amplifier power, subwoofers, cable thicknesses, and the like. But with the women outnumbering the men six to one -- and I know I’m generalizing here -- this group’s questions focused on that most visible audio component, the loudspeaker, and how to get good sound from a pair of them without having to plonk down two wooden boxes in the most conspicuous and least convenient places in the room. I was stymied. The only components I could think of that fit my questioners’ requirements were the Mirage Nanosats -- and even those not because they’re so attractive to look at, but because they’re small and easily placed. Most speakers are built for and by men. For the most part they're blocky, bland, and have all the elegance of a Soviet tank. Sure, you can dress up that box in a nice veneer and sculpt its shape a bit, but you’re still left with a rectangle that bears more than a passing resemblance to the container within which it was shipped. But this lack of real elegance is fine, really, because we're audiophiles, right? It's the sound that's important, not the aesthetics. Imagine what a price-no-object, sky’s-the-limit loudspeaker might look like had the person fully in charge of its design been a woman, if feminine sensibilities had guided that process, beginning with the mandate that the speaker must [gasp] be beautiful to look at. Sure, it’s got to sound spectacular -- that’s a given -- but if it’s not also drop-dead gorgeous, then as far as this particular chief designer would be concerned, it’s a flop. One thing’s for sure: the final result wouldn’t be yet another rectangular wooden box.This preamble isn't idle banter. I wanted to get you into the mindset you're going to need in order to properly appreciate the Crystal Cable Arabesque, the subject of this review. Without some form of attitude adjustment nudging you away from the audiophile nothing-matters-but-sound viewpoint, well, you just wouldn't get it. The Arabesque is a speaker in a class of one. It's a rare item -- a component that's designed to be an object of art that can stand alone even when not connected to a stereo system. And it's got a price tag to match, retailing as it does for $65,000 USD per pair. The new Ultra Audio gallery contains a number of excellent photos of the Arabesque taken by our own Doug Schneider; I suggest you take a good long look at them. But photos don’t tell the whole story. I’ve had a pair of Arabesques in my listening room for several months now, and each time I walk into the room, I find my breath taken away by their cool, crisp structural elegance. Before we go any further, I want to make one point, and make it clearly: The Arabesques are not novelty speakers. Don't let the audiophile mindset sway you towards thinking that they're a beautiful enclosure housing transducers chosen as an afterthought. This speakerwas conceived as an assault on the high end, and much sweat, brain power, and design work went into its creation. The flip side of the it's-got-to-look-good coin, according to Gabi van der Kley, the president of Crystal Cable, is that if it doesn't sound superb, it's also a failure. These are stiff, almost diametrically opposed design goals. At the beginning of 2009, in his "The Traveler" article in SoundStage!, Doug Schneider went into great detail as he recounted the story of the Arabesque’s design and I'd like todirect you there to read about the speaker’s fascinating genesis. Since Doug's already covered in great detail most of the technical makeup of this speaker, I'll just provide you with an overview so that I can get on with what matters most -- how this speaker sounds. Constructed of strips of 3/4"-thick glass, the Arabesque presented a daunting reverse-engineering challenge. According to Crystal Cable, only one company, in Germany, was up to the challenge of cutting the glass with sufficient precision. The strips are glued together with an adhesive that bonds only in a vacuum. Looking at the joins from any angle reveals a complete lack of voids between edges. Such precision gives the speaker an additional helping of visual elegance. As the Arabesque is completely transparent, the engineers were unable to factor any internal damping materials into the design -- the overall elegance would be somewhat diminished by a bunch of Dacron stuffing jammed inside, right? The Arabesque’s three high-end Scan-SpeakIlluminator 6.5" mid-woofers seem to float in mid-air, andfrom this technophile’s view, their sculpted baskets and brushed-steel magnet assemblies complement the cabinet’s austere beauty. The single ribbon tweeter is a solid silver-colored block that neither enhances or detracts from the speaker’s overall grace, but at least it’s well finished. The woofers are connected in parallel: all three are fed the same signal. This means the Arabesque is a two-way speaker, which was part of the design right from the start. 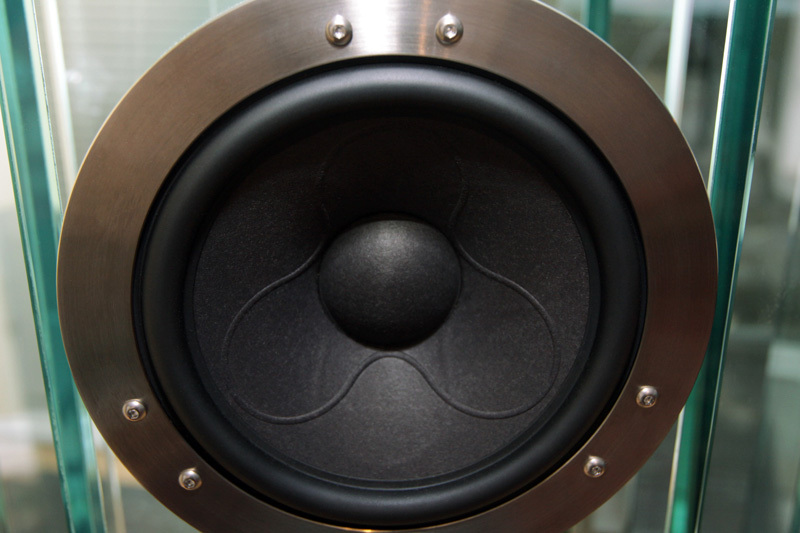 The woofers are connected via a single internal run of Crystal Cable Dreamline wire, beautifully dressed and routed for a clean, spare appearance. The cable disappears into the bottom of the speaker, heading into the base, a solid block of stainless steel that serves double duty as the home of the speaker’s crossover, which resides in a hollow machined out of the bottom. Some mundane facts about this ethereal speaker: Crystal Cable claims a high efficiency of 95dB and a lowish impedance of 4 ohms, both figures no doubt the result of those three woofers running in parallel. My 100Wpc tubed amplifier had no trouble running the Arabesques to outlandishly loud levels. 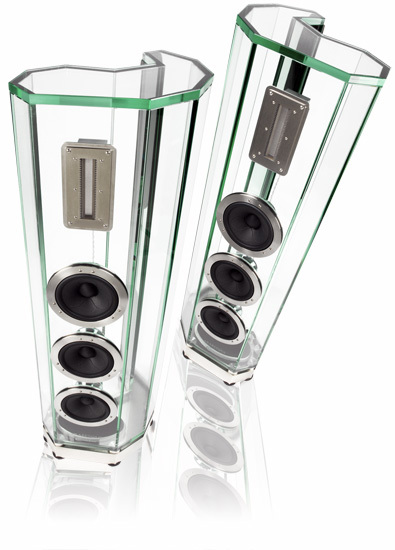 Crystal claims a frequency response of 27Hz-100kHz, +/-3dB. The Arabesque is weighty, tipping the scales at 220 pounds. Hopefully, the dealer will help with installation, especially considering the coffin-sized wooden crates the speakers are shipped in. According to Benjamin Scarcelli of Audio Basics, Crystal’s Canadian distributor, the Arabesques themselves are quite rugged -- there’s no need to worry about them shattering. Still, I didn't move them very much just in case . . . 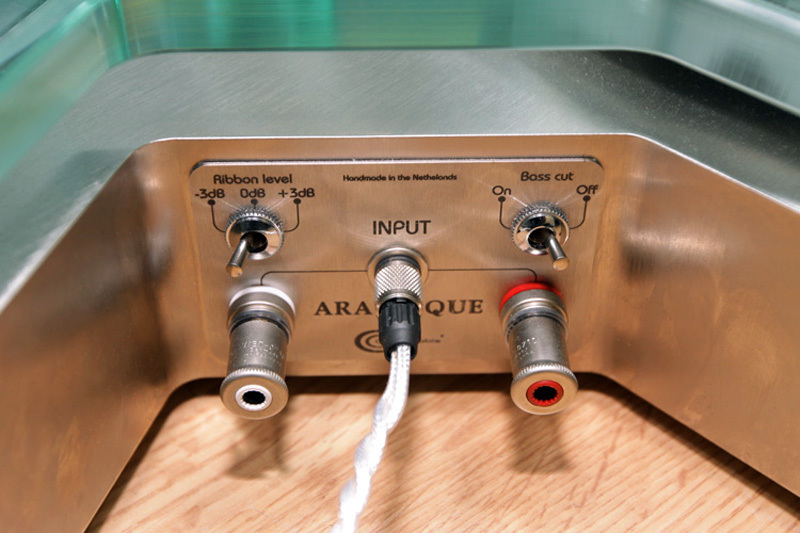 The Arabesque is set up for single wiring with normal binding posts, and also with Crystal Cable's proprietary screw-on connector for use with the company's own Dreamline speaker cable, which I used for the duration of this review. The 9' Dreamline cables retail for -- gulp -- $17,500 the pair.Sharing space near the speaker connector are two switches: one controls the bass alignment, and the other boosts or cuts the treble. I left both switches in their neutral positions, which seemed to work just great for my needs. The Arabesque's connectors and switches. I drove the Arabesques exclusively with my Audio Research VT100 tubed amplifier. I experimented with both my own Analysis Plus Solo Crystal Oval balanced and sets of Crystal’s Dreamline interconnects between amp and preamp, and between preamp and phono stage. Some swapping back and forth revealed a clear (ha!) preference for the Crystal Cable wires. About halfway through the review period I received my new Roksan Shiraz cartridge, which I put in place of a Shelter 501 Mk.II cartridge. The Arabesque speakers instantly showed me how much better the Shiraz is than the Shelter. Near the end of the review, Gilbert Yeung of Blue Circle Audio delivered his latest phono stage, the BC703 (review forthcoming). Once again, the Arabesque made no bones about the superiority of Gilbert’s latest assault on the state of the art over my own Aqvox Phono 2 CI. This is one heckuva revealing speaker. My Sonic Frontiers SFL2 preamp still makes me happy, why get rid of it? Same goes for my Pro-Ject RPM 10 turntable. It’s so pretty. Power was ably conditioned by my Shunyata Research Hydra Model-6, and power cables were Shunyata Taipans, though I did experiment with Crystal Cable’s Dreamline AC cords. I couldn’t conclusively choose a favorite between these two, so I left the Shunyata cords in place as it means one less thing to do when I have to return everything to Crystal. It took a while to get the Arabesques set up to my satisfaction. Because those three bass/midrange drivers present a large line array, I found I needed to get some distance from the speakers before the outputs of its four drivers fully integrated. My seating options limited me to a maximum of 9.5’ from the fronts of the speakers. This distance, in my opinion, is just barely enough. Ideally, I’d liked to have been another 1’ or 2’ farther back. Sitting so close to the speakers meant I couldn’t quite get as expansive a soundstage in my room as I’d heard in the much larger room in which Crystal Cable demonstrated the Arabesques at the Salon Son & Image, in Montreal. Still, even with this limitation, the Arabesques settled in wonderfully. I found a heck of a lot to like about these formidable speakers, but from the first note of every listening session, three qualities consistently jumped to the fore. First, there was an impressive top-to-bottom coherence. I’ll go into details shortly, but in brief, the speaker’s top end was delicate and airy yet juicily substantial, and the midrange meshed wonderfully with it, with a very slightly forward sound. Add to that a rich, reasonably weighty bottom, and this speaker immediately grabbed my attention right across the audioband. But don’t read "immediately grabbed my attention" and "very slightly forward" as code for "the Arabesque is a forward-sounding speaker." That wasn’t it at all. I consistently found myself listening to the Arabesques at higher-than-usual volumes, and that’s not something I can do with an aggressive speaker. The Arabesque was not in the least aggressive, but immediately grabbed my attention by presenting heaps of detail in an utterly relaxed manner. Take the domestic pressing of Nirvana’s Unplugged in New York (LP, DGC 24727), in all its poignant majesty. This album was recorded rather hot, and any additional crispness would have made me reach for the volume knob. Through the Arabesques, I could listen to "Lake of Fire" at near-live volumes. When cranked up, the Arabesques pushed Kurt Cobain’s voice slightly forward of the plane of the speakers without shoving it down my throat. The rest of the band held realistic positions without any instrument receiving preferential treatment. In fact, the lateral spread of instruments and the depth of the soundstage were very good, considering how close I sat to the speakers. I’m not sure to what I should attribute the Arabesque’s lightning way with dynamics, but I’d wager it’s got something to do with those three midrange drivers working in parallel -- they don’t have to move anywhere near as far as would a single dedicated driver pushing around the same volume of air. I imagine they can thus react more quickly to the signals they’re fed. Whatever the reason, the Arabesque was one snappy speaker. The third quality was the overt silkiness of the Arabesque’s ribbon tweeter. If I were listening to the Arabesque blind, without knowing anything about its driver complement, I’m certain I’d guess I was listening to a ribbon tweeter.There's a combination of almost limitless extension, quick dynamics, and just plain old sweetness to a good ribbon tweeter, and the one in the Arabesque is very good indeed. According to Crystal, the Arabesque’s midrange drivers hand over to the tweeter at a very low 1800Hz, which means that one heck of a lot of information is coming through that ribbon. But the tweeter never sounded as if it was operating at an extreme limit. Right from the high notes of Coltrane’s sawtooth sax to Elvin Jones’ crisp ride cymbal in "Resolution," from A Love Supreme (LP, Impulse! GR-155), the Arabesque never let on that it was straining -- in fact, quite the contrary. The Arabesque managed to make that ride cymbal sound silky-smooth while retaining all the dissonant harmonic overtones so often glossed over by other speakers. Perhaps my only complaint about the Arabesque is that I would have welcomed just a bit more bass slam. Not that the Arabesque was bass-shy -- not by a long shot. When I’m feeling the slightest bit down -- maybe due to girl troubles, maybe the weather -- I like to slam some Tom Waits on the ’table. My buddy Tom always makes me feel better. On "Make It Rain," from Real Gone (LP, Anti- 86678), there’s a serious drop-down note somewhere around 40Hz, and the Arabesques reproduced it with authority. The note was a little lower in level than I’m used to, but not outrageously so. The Arabesque’s low end was eminently satisfying -- rich, well-defined, steel-trap tight -- but didn’t have quite the impact you’d expect from a $65,000/pair speaker. For this kind of coin, I’d expect to feel the impact from percussion instruments in my chest. One of the Arabesque's three Scan-Speak Illuminator drivers. But consider that slight lack of slam in context. I’m holding the Arabesque to the standards of a speaker that can only be considered extremely expensive. However, the Arabesque’s overall coherence, its silky highs and rich, juicy midrange, made for an absolutely immersive listening experience that needed to make no apologies for its gorgeous appearance. While the Crystal Cable Arabesque is by far the most expensive speaker I've had in my room, it's also the best-sounding speaker I've had in my room. But the Arabesque is not aimed at the normal audiophile. Those who care about sound quality first and foremost, with all other considerations falling far, far back, won’t be willing to spring for the cost of entry. Instead, they’ll look for a more conventional speaker, probably one that sells for less money. No matter how much I love its sound, the Arabesque is not meant for me. But I can imagine a music lover who values great sound, who has more money than God, watching his wife go gaga over the Arabesques as she visualizes these two massive Swarovski crystals perched in the middle of her living room making wonderful music. That audiophile, I imagine, would see the Arabesque as an absolute bargain.